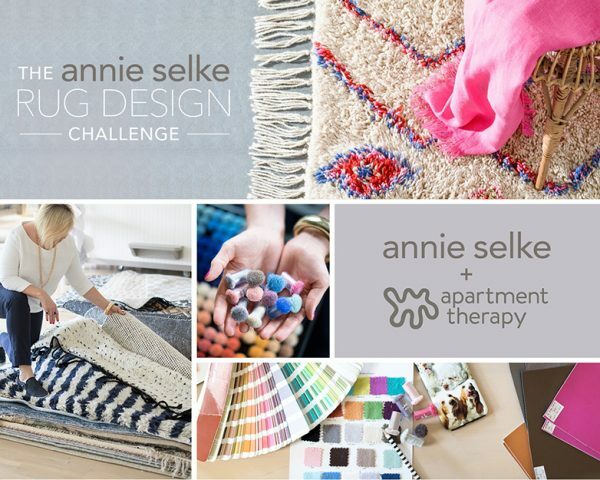 You are here: Home / Annie Selke Rug Challenge / Which Rugs Would You Choose? Let’s call the first one “Floral Stripe”. It’s a cross between Dash & Albert’s “Catamaran Stripe” and some vintage textile “strips” I found on Etsy. I was thinking it would even be cool to use charcoal-colored thread to simulate the seams between the “tiles”. Last but not least, rugs #4 and 5. 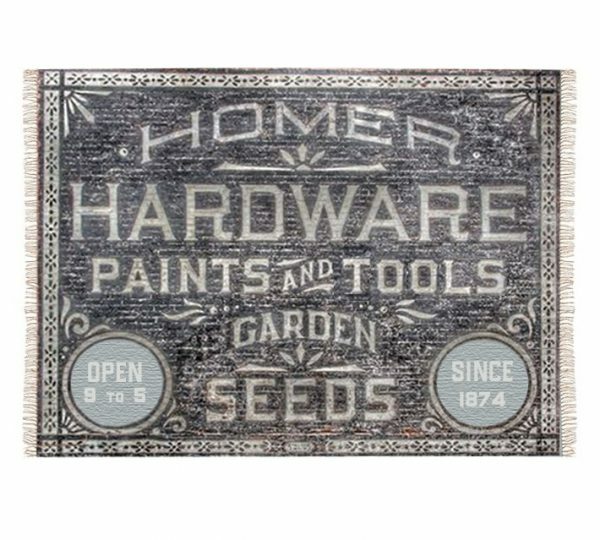 They were inspired by the old painted advertising signs you used to see on the sides of brick buildings, and I’d love to produce a whole lettered line of these things! I can see them in a bathroom, in front of a kitchen sink, or by a back or front door. The colors and message possibilities are endless on those, but they can only face one direction, and probably wouldn’t be used as area rugs, so I’m not sure those would be the best submissions. ? That’s why I need you to help me decide! If you would be so kind as to choose three designs in the poll below, that would give me a better idea of which three I should enter into the challenge. Voting starts next week, and I can’t tell you how excited I am to see all the other designs too. I’ve never done anything like this before, so I have no idea if what I created will stand a chance, but it sure was fun putting them together! I can’t select 3, but i the floral stripes all colorways and would totally buy one! Its not allowing me to pick three. I really like the last three. 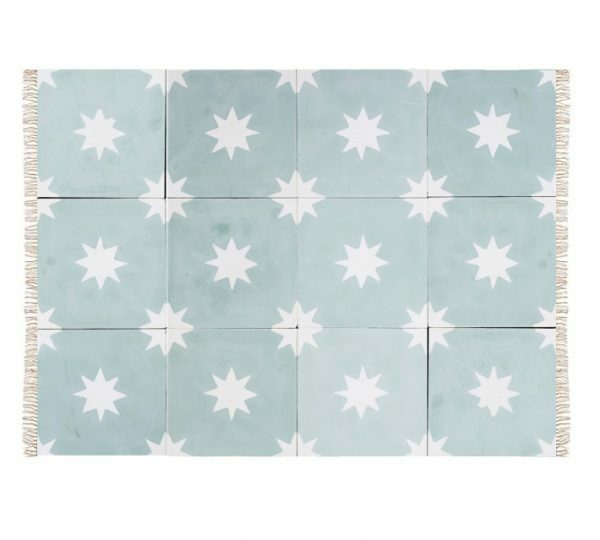 The tiled star and the worded ones. It would only let me vote for one. But I would choose- floral stripe blue, octagon and Homer hardware. Ditto for me!! I actually voted for the octagon but wanted to vote for the other 2 as well. I could only pick one but I like the last 3. I love the pink “pixelated” one the very best!!! Would buy it in a heartbeat!! I could only vote for one. I like the star, the pixilated flowers on the side and the green stripe with flowers. Good luck, Layla! It was only letting me make one choice, but I would choose the blue rose, octogon star and the hardware one! I loved the pixelated version of the cross stitch roses, but it’s not an option to vote. I like the fact that it looks weathered and antiqued vs. pixelated. I also like it on the left vs. center. I don’t care for the other cross stitch roses because they look too perfect. Really, all the designs are great, Layla! Exactly what I would expect you to design. 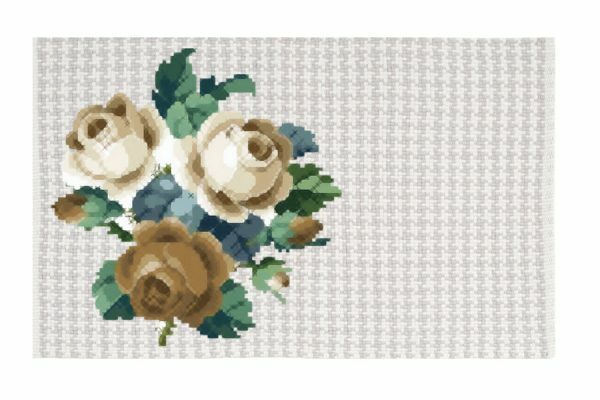 I really like the pixelated cross stitch look with the roses to the left – I like the example you have there, including the colours. 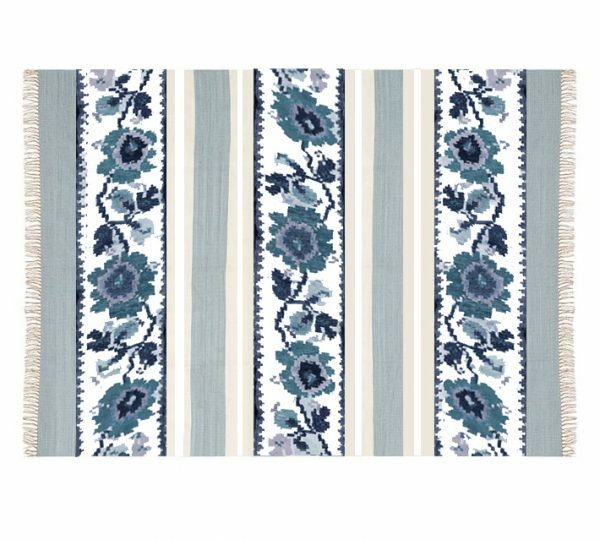 I pick the blue floral stripe as my favorite. 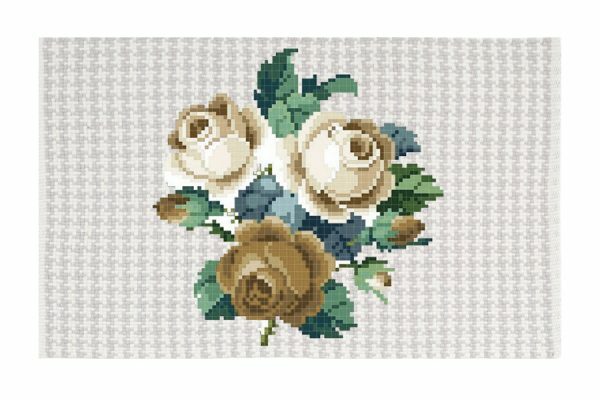 I like the pixelated cross stitch looking example with the off center roses. 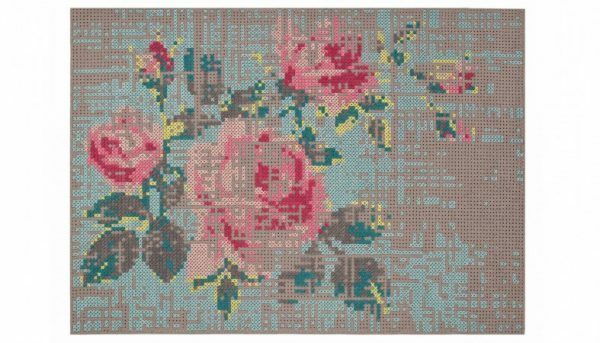 Maybe you can make some changes to your roses rug design. I like both of the sign rugs too. I recently happened about your blog and I enjoy it so much. 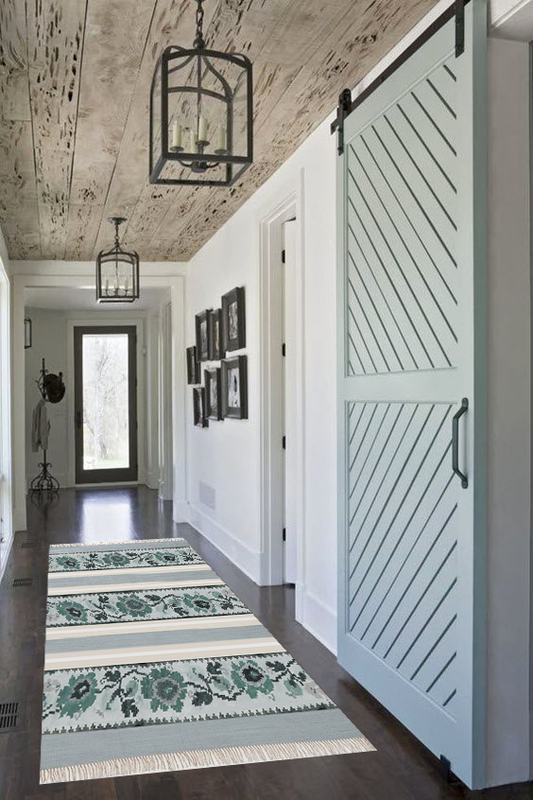 You are so talented and I am amazed at the ideas that you come up with – these rugs are the perfect example! I would purchase every one of them 🙂 my fave was the blue floral stripe! Thanks for everything you give to your readers – it’s such a gift! Have a great weekend! I loved the pixelated cross stich the best, but it was not an option to vote. The other cross stitch versions are too perfect, but the pixels look almost weathered or antiqued. The color combo is perfect, and I love the left alignment. They really are all great designs — just what I would expect from you! Hi ya. It would only let me vote once as well. So….. 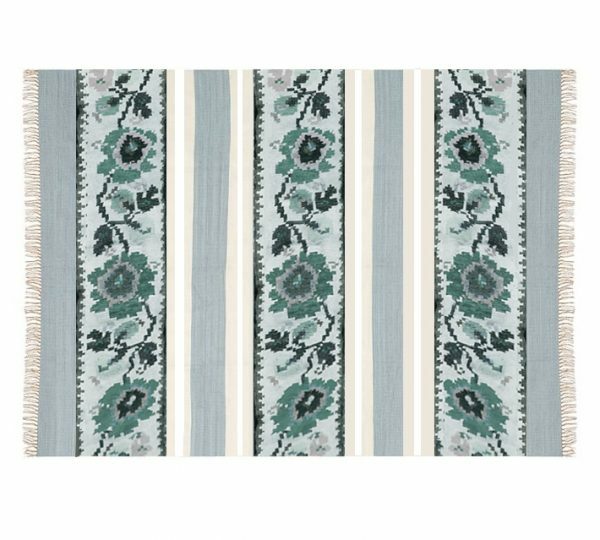 I vote floral stripe blue and green and homer hardware. Good luck Layla! Very pretty. Very cool. Wow! You just ooze creativity! Love them all, but I voted for the blue floral stripe. The ones with the lettering are aDoRaBle, but I guess you’re right about them not making good area rugs. Good luck Layla! Good job, Layla! I would scoot the roses off center like the inspiration though. The sign ones are great! Good luck! I would have voted for the floral stripe in the brighter colors! I can see it under a white sofa with bright pillows or in a breakfast room or in an entry… such perky welcoming colors! Miss Mustard Seed used to have a rug/floor mat in her dining room that had an old alphabet on it. It was a fibre type with black lettering that she got somewhere. 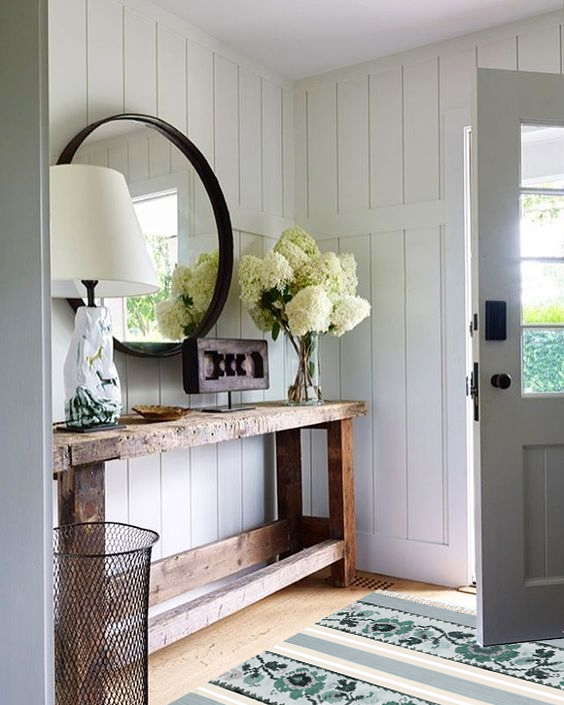 It looked nice in her setting so I could see your last 2 styles working as area rugs as well. I was able to vote for 3 and I picked the last 3 designs because they were more unusual. Fun designs all! I think floral stripe looks fresh and bright. It is not a rug you see everywhere. It also looks like your style. The other two in my opinion are cute or pretty but not sharp! 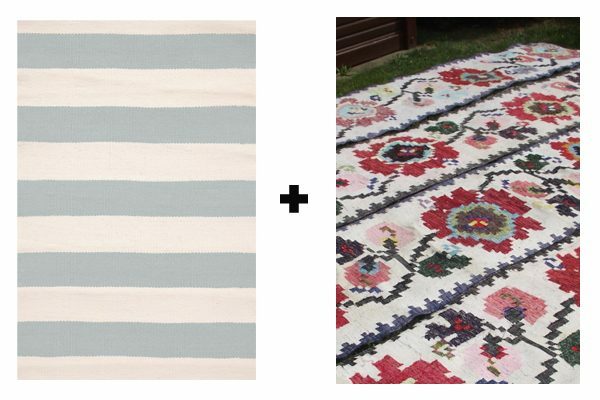 I enjoyed this post since I have never even thought about designing a rug. 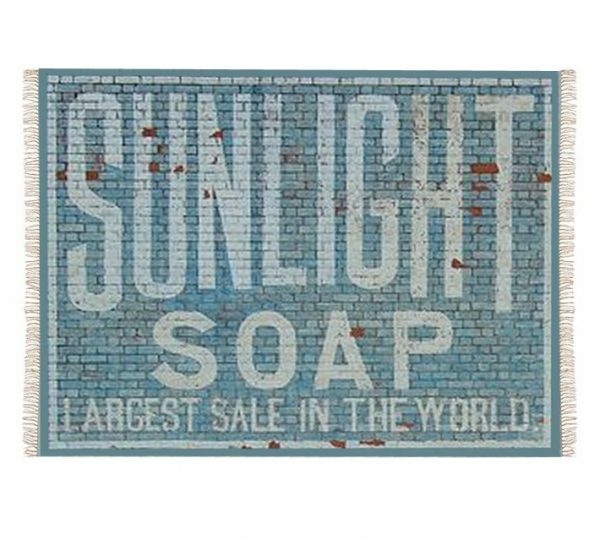 I voted for the Octogram Star but also would have voted for the Floral Stripe (either color) and I like Sunlight Soap. I voted for the Hardware rug becauase it’s perfect for my art room! 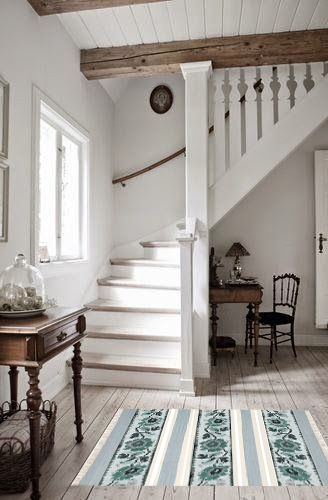 Layla – I love “your” rug ideas!! But – I am having a consistent problem Pinning anything from your blog. 🙁 (I don’t have this problem on any other blog or website). When I click Pin, the Pinterest popup comes up, but the picture does NOT… any thoughts on how I can remedy this? I try 4 different Pin buttons – the one you supply, the other one that shows on your pictures (I guess from my browser) the other one on my browser by the line where your web page is shown, plus the drop-down one. I have also tried using a different browser, to no avail. Thanks in advance! So creative! 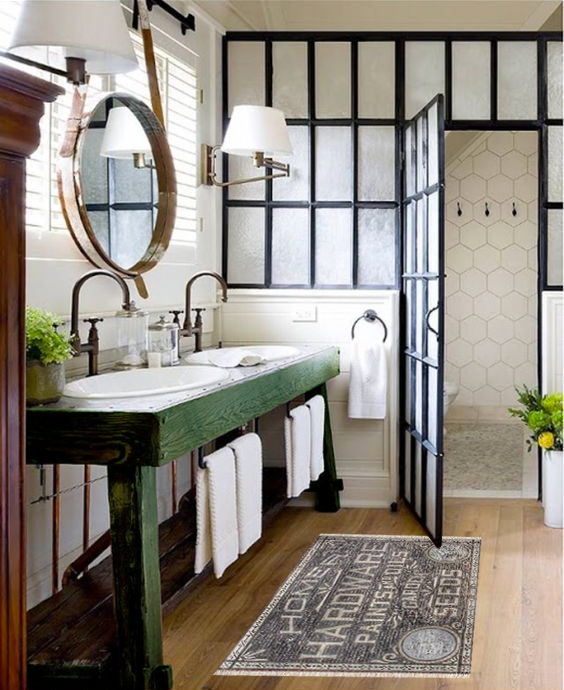 I love the “old sign” rugs! They are so original. I haven’t seen anything like that. 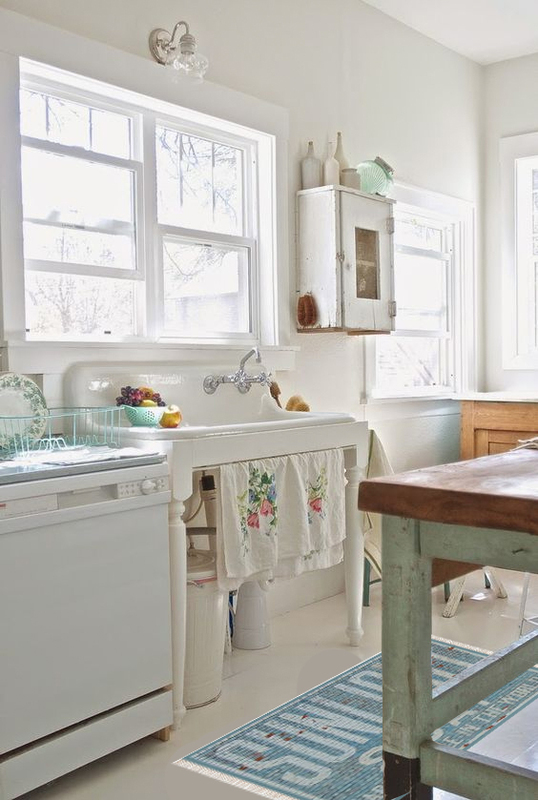 I would love to have one for in front of my kitchen sink. Great job! Your vision always amazes me Layla!! Sooooo creative!! I ADORE “Then Octagon Star” it’s so versatile! That got my vote! Good luck! I was able to vote for three, just an FYI. I love the floral strip in blue, and the hardware one, they got my vote! Voted and such a cool thing to design!! Here’s to hoping you win! Such cool design’s and looked like so much fun. So cute! What creative ideas. I would buy any of those right now. I like the pixelated cross stitch on the best and the last two sign like ones. I love love love the pixelated version of the cross stitch rose!!!!! OMiGosh! How wonderful! I vote for the pink rose that looks really aged + worn. I have no pink in my house, so could you possibly switch it to blue? My favorite is the pixelated one! Couldn’t vote for that one though. I love the pink pixilated rose carpet!!! I voted for my other three fave though since that one wasn’t an option. Good luck! !